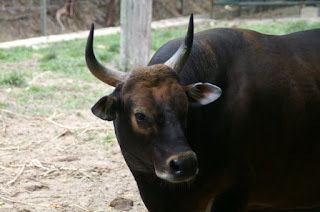 The tembedau, the local name for wild cattle, resemble the domestic cattle in size and colour but there are distinct differences between the male and female. The male has a dark chestnut-brown coat and is almost blue-black in the Bornean species while the female and juveniles are reddish brown with a dark dorsal stripe. Both male and female have horns but the male's horns are much larger and thicker than the female's. They also have the characteristic white 'stockings' on their lower legs, a white rump and muzzle, and white spots above the eye. Tembadau prefer to feed in open clearings and will depend on dense forests to seek shelter and safety. In Borneo, they occupy secondary forests that form after logging and fires, and open clearings. They are shy creatures and are wary of intruders. Tembadau are active during the night or day but in areas of human population-they tend to be more nocturnal.